SILVER SPRING, Md. --- In continued celebration of the 500th anniversary of the Reformation, the General Conference headquarters of the Adventist Church will be increasing the number of fundamental beliefs of the denomination to 95. 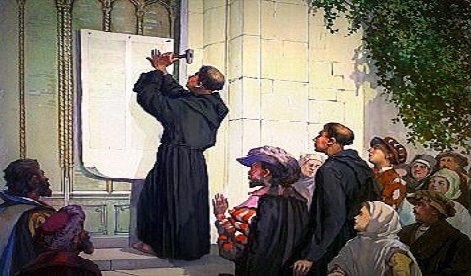 "Luther had a lot more wiggle room with his 95 theses than we have with our current 28 fundamentals," said GC Director of Fundie Creepe, Max Credo. He said that although a 14-page draft of suggestions for extra fundamentals is currently making the rounds of various GC committees, there are "endless possibilities" for the expansion of the Adventist statement of belief. Creepe said that official statements on matters as vital as preferred veggie meat brands, permissible academic integrity and the ideal length of nature walks had been "waiting for years to be enshrined in Adventist creed." With 95 rules coming down the pike, we are no better off than those Pharisees & Sadducees of Bible times. What’s a church member gonna do? Me, I’m gonna cry just like the publican. Woe iz me!! BENEFITS OF LEAVING THE SDA ORGANIZATION AND LIVING AS A MERE CHRISTIAN…..
YOU CAN ACTUALLY REST ON SABBATH. YOU CAN WITNESS TO OTHERS WITH THE EXTRA TIME. YOU CAN USE YOUR BLESSINGS AND MONEY TO DIRECTLY HELP THOSE IN NEED. YOU WILL HAVE REMOVED A BIG YOLK. NO MORE MEDIATOR, JUST YOU AND GOD. YOU WILL SAVE MONEY FROM NOT BUYING OTHER INSPIRED BOOKS..
YOU CAN ENJOY CHRISTIAN PROGRAMS ON TV IN YOUR PAJAMAS AND HAVING BREAKFAST……..
MAY NOT SEE YOUR FRIENDS AS MUCH. YOU MAY NOT GET ALL THE TAX DEDUCTIONS FROM GIVING TO THE SDA. YOU MAY ACTUALLY MISS THE SATURDAY COMMUTE AND HUSTLE AND BUSTLE. YOU WILL MISS OUT ON SOME GOOD MUSIC…… DEPENDING ON WHICH CHURCH YOU ATTEND.